Gallipolis Elks Football A-Team. Front row from left to right, Braylon Rathburn, Hunter Peterson, Carlito Long, Dakota Siders, Isaiah Dunlap, Peyton Owens, Conner Roe, Hunter Shamblin, Tayshaun Shortridge. Second row, from left to right, Tyler Young, Hudson Shamblin, Matthew Gordon, Caleb Stout, Aiden Toler, Bradt Ducan, Nathanael Baird, Logan Siders. Third row, from left to right, Austyn Smith, Cole Hines, Matt Liberati, Brody Moore, Kenyan Franklin, William Mullins, Joey Darnbrough. Fourth row from left to right, Head Coach Mike Canaday, Cade Mock, Devin Hernandez, Nick Janes, Quinten Vanmeter, Carlos Thomas. Fifth row, from left to right, Assistant Coaches, Chris Rathburn, Buddy Moore, Jason Liberati, Chad Shamblin, Jason Rose, Tim Siders. 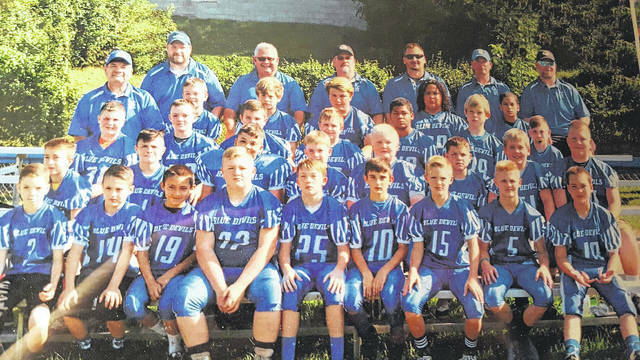 GALLIPOLIS — The Gallipolis Elks Blue Devil Youth Football A-Team completed its season with a perfect record of 11-0. The 2017 team competed in the Teen O.V.C. League, compromised of 10 teams. These are the youth teams from the same schools that Gallia Academy High School now plays with the addition of Symmes Valley and South Gallia. The A-Team is made of fifth and sixth graders from the Gallipolis City School District and were unbeaten in the regular season 8-0. The team tied with Fairland, who also were 8-0, for the league co-championship. These two teams did not play each other in regular season, but met in the Super Bowl after both teams twice beat playoff opponents, making their record records 10-0. The Elks Blue Devils then defeated Fairland 38-24 to become the 2017 Teen O.V.C. champions. The team would like to thank the community and the Gallipolis Elks for its support and to encourage more youth participation in the future. Information submitted by Kim Canaday. https://www.mydailytribune.com/wp-content/uploads/sites/42/2018/01/web1_24126-1.jpegGallipolis Elks Football A-Team. Front row from left to right, Braylon Rathburn, Hunter Peterson, Carlito Long, Dakota Siders, Isaiah Dunlap, Peyton Owens, Conner Roe, Hunter Shamblin, Tayshaun Shortridge. Second row, from left to right, Tyler Young, Hudson Shamblin, Matthew Gordon, Caleb Stout, Aiden Toler, Bradt Ducan, Nathanael Baird, Logan Siders. Third row, from left to right, Austyn Smith, Cole Hines, Matt Liberati, Brody Moore, Kenyan Franklin, William Mullins, Joey Darnbrough. Fourth row from left to right, Head Coach Mike Canaday, Cade Mock, Devin Hernandez, Nick Janes, Quinten Vanmeter, Carlos Thomas. Fifth row, from left to right, Assistant Coaches, Chris Rathburn, Buddy Moore, Jason Liberati, Chad Shamblin, Jason Rose, Tim Siders.